Okay, so maybe we’re not talking about the ‘60s and the madness of the era. However, when I think of the new film World War Z (based on the novel by Max Brooks), this is the only thing ringing true in my head. America’s obsession with all things zombie has finally hit its peak, with one of Hollywood’s most bankable stars headlining a zombie movie. However, it’s not really a zombie movie as much as it is a survival/suspense movie; its PG-13 rating almost preemptively prohibits the kind of nastiness you’d expect from a full-on zombie movie. Instead, the filmmakers have taken a different approach and given us an easy – but relatively well-tensioned – semi-horror movie, the kind that goes down well on a hot Saturday afternoon in the summer. Director Marc Forster, most notably known for directing James Bond’s 22nd film Quantum of Solace, has proven himself capable of handling high action and globetrotting government agents. However, there’s no wink-and-a-grin with a martini on the side; this time, there’s nothing but straight dread and decay, from the film’s opening frames to the nearly formulaic ending. The grim atmosphere casts a constant shadow over the entire film, making the lack of graphic gore and violence almost a moot point. However, if you’re looking for scares, you’re looking in the wrong place; World War Z is fairly tense, but it’s not so intense as to be off-putting to viewers, and that’s definitely a knock against the movie. While aiming for a mass audience, the notion of the “zombie movie” has been tossed out the window, resulting in an almost-emasculated, bloodless action movie. World War Z walks as much as possible in the middle of the road, not wanting to be too safe or too offensive. In my eyes, that hurts the film, as it seems not enough chances are taken to make this anything more than a good way to kill time. However, taking away all the dressings of a zombie movie, Forster has forged a pretty clean action film, with suspense-filled scenes that keep anybody guessing as to who’s going to wind up as lunch for the monstrous hordes. Former United Nations investigator Gerry Lane (Brad Pitt) is called back to his old position after American cities have been violently overthrown by zombies – yes, they use the “zed” word, Shaun Riley – and is tasked with trying to find the origin of the outbreak. Throughout the entirety of World War Z, there seems to be the thread that Lane is just an extremely unlucky person, with zombie attacks happening wherever he goes; from his hometown of Philadelphia to South Korea to Jerusalem and elsewhere, these things seem to follow him around, regardless of whether or not he’s in a “safe” location. Either that or he just happens to be in the area where events are transpiring to bring the zombies down upon them en masse. Regardless of the circumstance, he seems to be witness to some pretty horrific invasions, barely wriggling his way out of them alive. Another facet of World War Z that I find interesting is that the film never really reaches a climax; instead, it starts off at a breakneck pace and doesn’t stop until the credits start rolling, with nary a wobble or a slow point in between. Forster, through camerawork and flashy editing, maintains a good energy throughout, keeping the suspense high and the stakes raised. The positives far outweigh the negatives in this movie, especially in the performance department, with Brad Pitt providing a solid anchor for the cast. I appreciate that he doesn’t just play the pretty boy with the childish grin, like he usually does; he turns in some good work as a man trying to protect his family and his fellow citizens, pushed to the edge of his rope and barely hanging on to it. Also notable is newcomer Daniella Kertesz, playing his Israeli protector, Segen; with absolute stoicism, no nonsense, no hysterics, and no gloryhounding, Segen is a tough cookie who can hold her own with Lane, going step-by-step with him through some incredibly perilous circumstances. If you’re looking for a real zombie movie, I’d recommend either version of Dawn of the Dead; the original by George A. Romero and the remake by Zack Snyder are both, in their own right, classics. 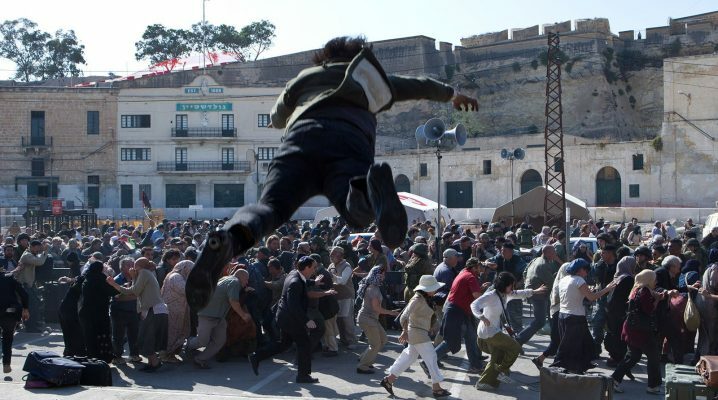 The zombies that populate World War Z are not Romero’s slow-walking creepers; instead, they’re more like Snyder’s sprinters, hellbent on turning whoever’s standing in their way into one of them. Without getting too graphic and violent, World War Z does sacrifice a hard edge for high tension, not really fitting into the zombie movie genre. Instead, it’s a relatively fun suspense/thriller that manages to hold your attention from the beginning and doesn’t let it go. Its 2D presentation will serve you just fine.